Bicycles – The common use of a bike has changed over the years by innovation, technology, personal habits and style. 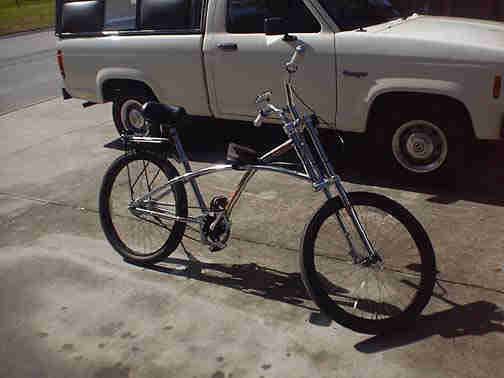 At 16, I had a black and white 3 speed English racer bike with hand brakes, full saddle bags, light, generator, speedometer, tic odometer, horn, radio with chrome tip bullet valve stem covers, white wall tires, cable protectors and a rear book rack. I loved my bike – it was stolen. 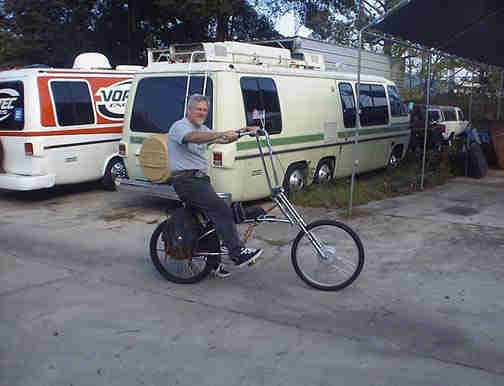 I bought this bike for my Dad to help him with his therapy . This was as close as I could get to a bike I had experience with and its not a bad bike – we’ll except that the seat is missing, the tires are rotted and the cables are froze up. 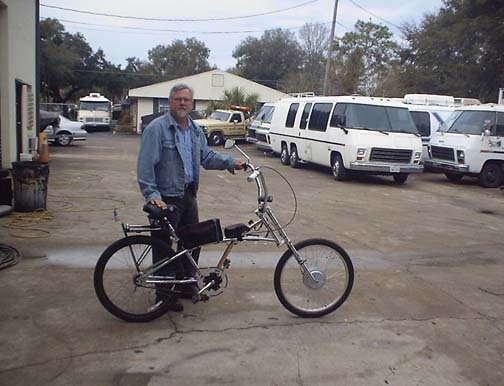 Now, I could take that bike apart, renew the bad parts, replace the rusted parts and I could have that bike up and running great and I have the ability to do that. When I finished the project how much money would I have in the bike and what kind of bike would I have – you see it does not make sense. You can buy a new bike just like that brand new for less than the renovation costs. So, the person who is restoring a GMC to original condition will have a great running, classic looking well performing motorhome. I enjoy the purist side of this hobby and appreciate what it takes to painstakingly reproduce a classic original. But you know, those tires were way to skinny, just a little loose dirt or sand and I’m nursing a case of road rash! I never could keep those brakes adjusted, they always dragged. 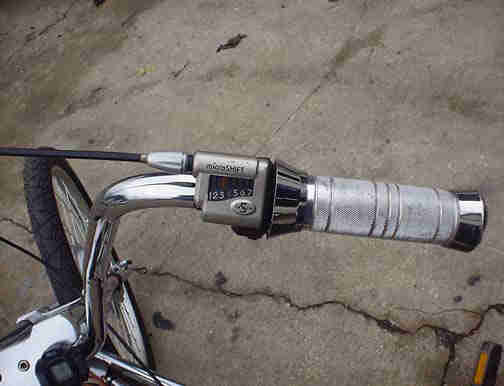 That 3 speed “thumb” shifter was a $%#@ to use. I want more now out of my bike today and there has been great improvements I could include. This is my new bike Now stay with me on this – This is an outrageous bike built to my spec by www.phatcycles.com . 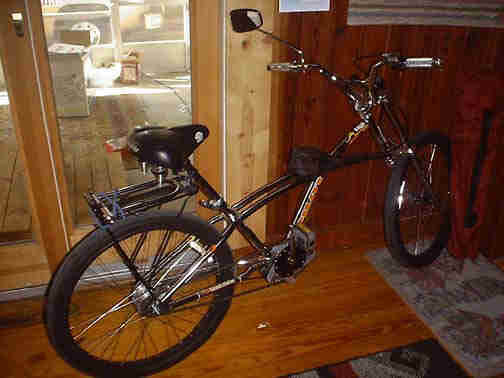 It has a 7 speed gear box with coaster brakes. 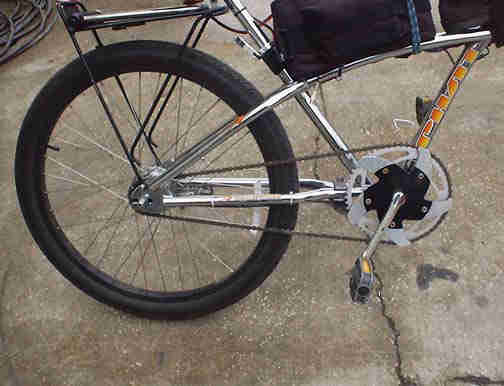 It has fat flat tread tires (26″ with black anodized rims and spokes). The aluminum front “triple tree” forks remind me of a “Fat Bob” front suspension (actually they do have a “Springer” front fork but I felt that was a bit too much). I ride this a bit, determine what special modifications I want to tailor the bike to my taste and VWALA I see this bike as the evolution of that English racer I once loved. 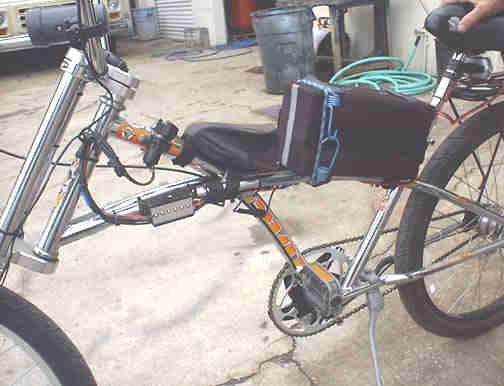 Adding to the high tech and style the bike had from the plant, I added a rear storage bar, storage enough for the snap in halogen headlight, LED flashing tail light & keys for the Krypton spoke lock. 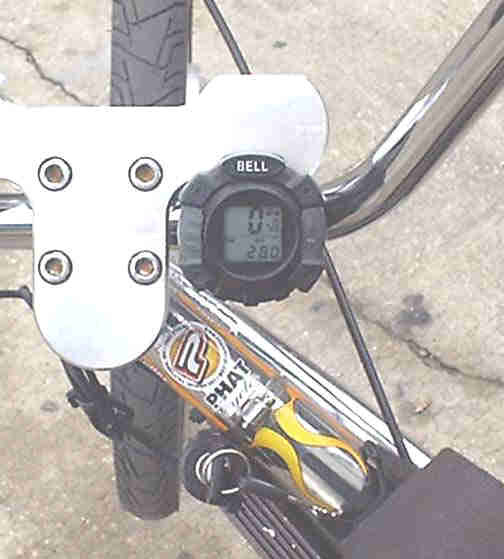 It has an analog speedometer/odometer fat-wide-off road style handle bars and polished chrome grips. Man, now we’re cookin with gas! Move over old dog, this new dogs movin in! There is room for both purist and customized in the GMC community – heck cars and car clubs dealt with this a long time ago. The purists know that without the money the custom hot rodders bring into the parts reproduction industry there would be far fewer companies building parts for them all. We enjoy both sides of the coin here at the Co-op. No, I’m not nuts but some say I am a bit overboard sometimes but hey, this isn’t one of them. We are talking here about combining the most efficient form of single person powered transportation with the new pulse digital power supplies and state of the art motor design. How can that fail! Follow me on this. Reading Car Craft as a kid, my dreams were filled with custom rides. I built plastic car models in our attic. With boxes of wheels, engines, frames and bodies, I mixed up wild custom cars. 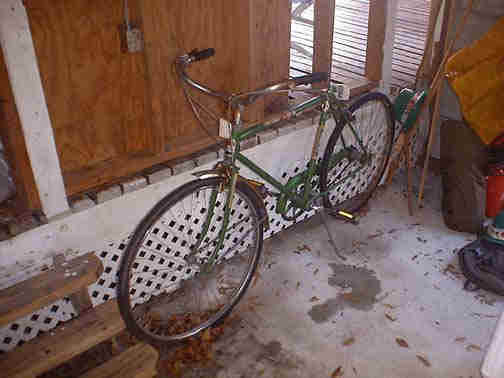 My 3 speed english racer bike was weighted down with a generator for lights, radio and turn signals. My saddle seat, saddle bags, horn, bullet tip tire valves and white wall tires creamed “CUSTOM”. Some people back then felt it was a bit much but it was mine and I liked the way it felt. Time marches on, priorities change and that decision of whether to wear the wing tip or penny loafer shoes gave way to selecting which 4 door truck, SUV or drop top sports car you will drive. Technology went from dim headlights to quartz beams and LED flashing tail lights. In comes what I call the logical evolution of my beloved custom bike using style hints and technology of today. No mid life crisis here, I’m moving straight to regression! I know it looks nutty but its actually very comfortable to relax on. I don’t like the way the sport bikes of today hold you in a “runner take your mark” position, all you would need is a corn cob print seat cover and you would have it all! No, I want to relax or cruise if you will when I ride a bike. Only problem is moving at 12 MPH takes to long to get somewhere. Our society is on the move and the speed of a bike just does not make you efficient. OK, the project is keep the comfortable feel but lets bump up the performance a bit. If we could get say 20 or 25 MPH for say 15 miles we could use a bike for true in town transportation– hey, but how can you do this? I don’t have “popeye” legs– sure I ran track in college but those days are gone and the thought of sweating hard to get to work then sweat some more is not that appealing to me. My custom bike has many performance features to include a 7 speed rear sprocket with a coaster brake , extreme rake extended triple tree front fork for that long, low, fat feel a gel filled springer seat, medium turn back “ape hanger” handle bars, a huge high speed front sprocket and digital speedometer among other things makes this MY custom bike. OK, so whats the big deal you say? 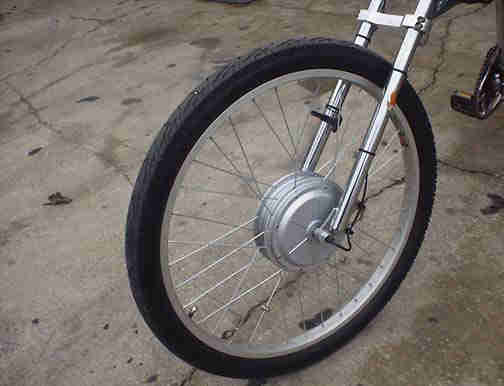 How bout a 36 volt, 400 watt motorized DC front hub , a 36 volt rechargable power pack and pulse digital control system and a little guts I can cruise for up to 18 miles with a moderate pedal assist at 25 MPH, @ 20 mph without pedaling! The unit recharges during the day to top power and is ready for a blistering skinny wheel ride home. I’ll post more pics soon but take it from me, after some systems alignment and testing, this baby has become a realistic choice for me to my transportation needs. Being @ 4 miles from work I cam power myself at any speed I desire pedaling if I feel like it and not when I don’t. My ride keeps its comfort requirement, I can have exercise if I wish or I can save my energy for work. I can do all of this at a speed that puts the electric bike into good reliable transpo. 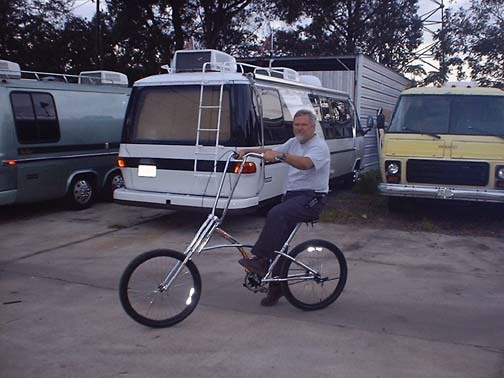 Hey, let gas go to Europes prices, I’m ready and I’ll be scooting with style— my style!